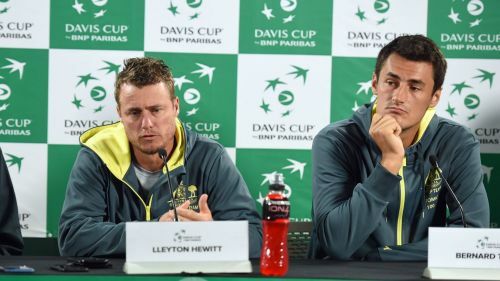 Bernard Tomic has branded Lleyton Hewitt a "liar" and denied accusations he threatened the family of Australia's Davis Cup captain. The feud between the pair has escalated dramatically at the Australian Open, after Tomic accused Hewitt of a conflict of interest in his team selections and claimed a number of current players dislike the former world number one. In an extraordinary news conference on Thursday, Hewitt accused Tomic of "blackmail" in relation to Australian Open wildcards and said the 26-year-old had made threats towards him and his family. "He won't play Davis Cup as long as I have anything to do with it," said Hewitt. "The threats I have received for me and my family for a year and a half now. It started with blackmail over wildcards over a year ago. I don't think he has my number anymore. "We are trying to set cultural standards to represent Australia in the Davis Cup. He hasn't been close to these in the last couple of years." Yet Tomic has now hit back in an interview with the Herald Sun, stating: "I have never threatened his family. Nice, Lleyton. To think how low of a person you actually [are]. [It's] why the Australian public never liked you. "I've got nothing to do with your family and I don't care what's wrong with you, you liar."